Umbrellas have been in existence for a long, long time and there are many historical texts, carvings, and images which confirms the same. 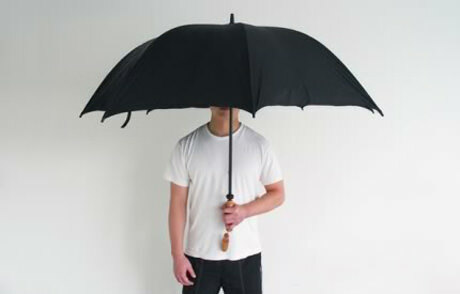 Nowadays, we do not give much importance to this handy tool which protects us from the rain and the sun. 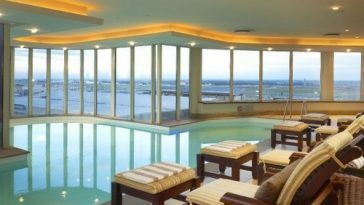 Umbrellas, are well just umbrellas for most of us and we do not invest much time while selecting one, and nor do we want to spend much. However, gone are the days when umbrellas would just be available in a few colors, now, together with having many color and size options, you get them in so many different styles and many of them are absolutely cool and unique and we shall discover 10 such coolest umbrellas right now. Have you ever noticed that the texture of your umbrella is somewhat like that of a projector screen? 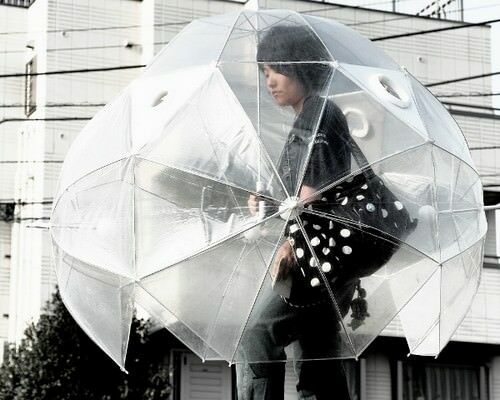 Well, you are not the only one to notice that, designers Sho Hashimoto and Takashi Matsumoto noticed that too and then created the Pileus Internet Umbrella. 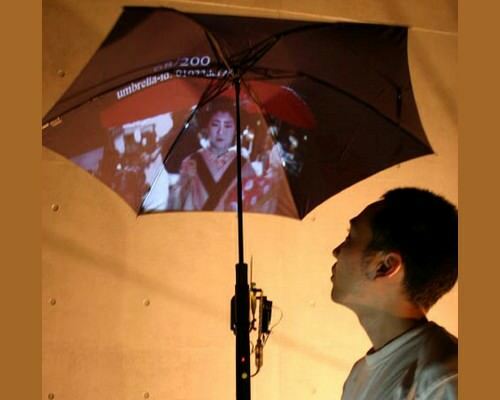 This umbrella will keep you dry in the rain but it also has a mobile PC and projector that displays live internet content. If you want to sing in the rain, Pileus can even play you a Flickr slideshow, let you watch YouTube videos, and even see the weather map updates. See also; Upcoming technologies of the world. So, you are a much-in-love couple and always want to be together, even when it rains. However, if you use a single umbrella, no matter how romantic it may appear, one of you are likely to get wet and then may fall ill. This can be prevented if you instead use a tandem umbrella. It has a simple design and two umbrellas are molded into one and end up giving you a bigger breathing space. 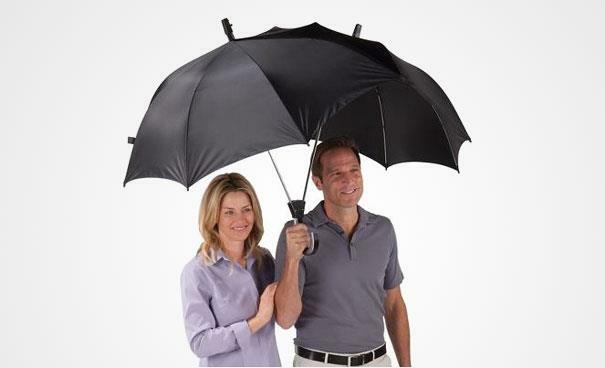 So, no matter if you are two lovers, friends, siblings, or a husband and wife you will certainly love this umbrella. 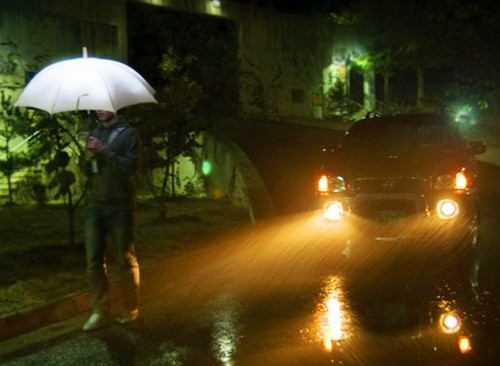 The LightDrops umbrella will offer you exactly what its name suggests. Once drops of rains fall on it, it converts it into light. This umbrella has PDVF, a conductive membrane that converts the falling water’s kinetic energy into electricity in small amounts. This electricity will basically be enough to provide power to the LEDs present inside the canopy of the umbrella. And, once the lights appear it certainly looks beautiful. So what makes this umbrella different? Well, firstly it has an amazing name and secondly its color changes when water pours on it. 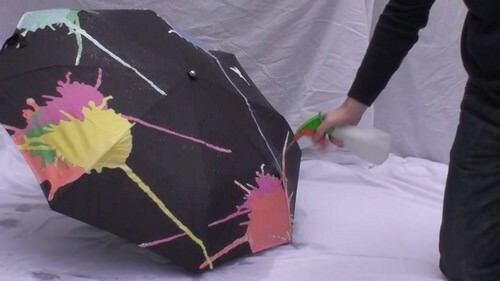 This umbrella has hydrochromic ink, a special kind of ink. the color of which changes when it comes into contact with water. It gets back to its original state once it dries. So to say, the umbrella is black when it is dry and starts showing its true colors whenever it gets wet. If together with the rains, you have heavy winds challenging you. Then even the biggest traditional umbrella will not be able to keep you safe and dry. Keeping this in mind the Superbrella has been designed which will keep you safe from sideways as well. It has been designed out of five clear umbrellas, one of which is present on the top and the other 4 in each of the cardinal directions. 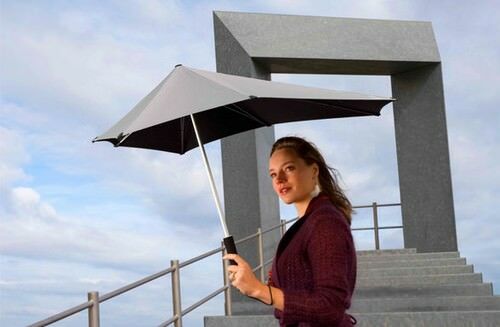 The umbrella certainly does keep you fully protected and at the same time looks super cool. If you are way too kind and always are worried about hurting anyone around while using your umbrella then this is the ideal one for you. 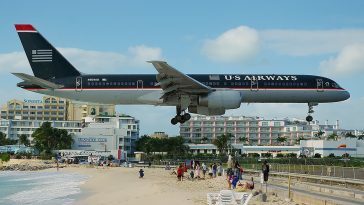 The Polite umbrella has a unique mechanism because of which its canopy can be contracted so that you do not harm anyone around. Just a string down below has to be pulled to enjoy the contraction. This umbrella does not have any high technology involved and has nothing really fashionable about it and yet is cool enough to be a part of this list. It works way better than any usual umbrella and does not blow out in high winds like the umbrellas you so long are using does. The tail of the Senz umbrella moves in the direction of the wind, adjusts to maintain its structure and keeps you completely dry. 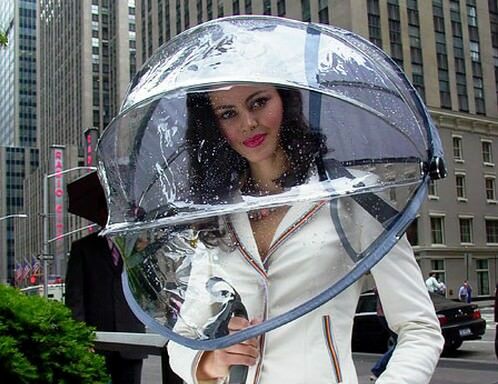 If you do not like holding your umbrella and still do not want to get wet in the rain then this one is for you. Though it is slightly expensive but you can be sure of staying dry without having to keep holding an umbrella. Nubrella comes with a strap system that easily fits over your shoulders, helping keep the umbrella in place even if it is windy and raining heavily. The nubrella collapses and you can then fold it together for easy storage. These umbrellas are really unique. Though the canopy, in this case, is just like any other traditional umbrella, the handles are what makes them different and fun. 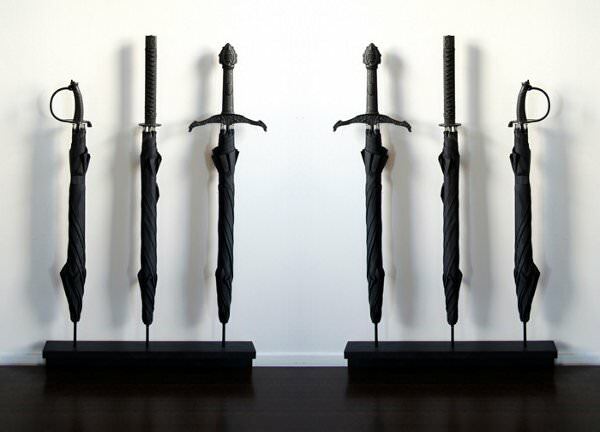 Though you cannot use them as real weapons but these sword umbrellas certainly look very cool. 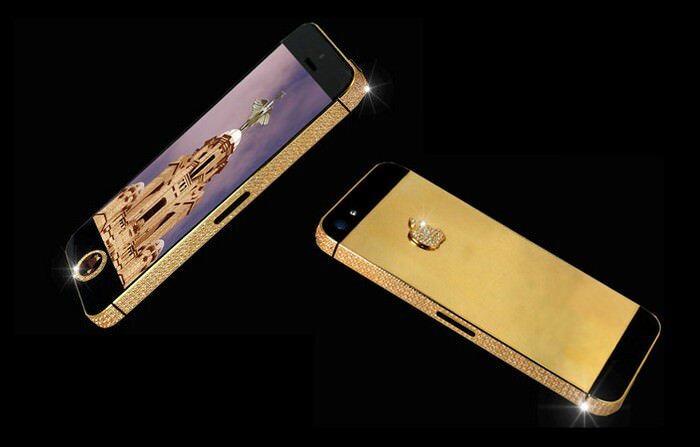 Buy one of them and you are going to love it for sure. 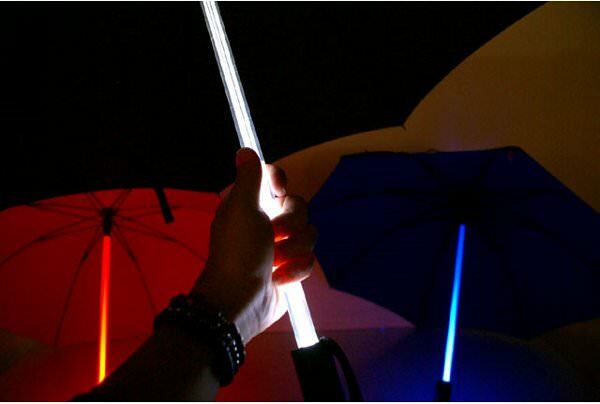 If you have seen the popular film Bladerunner you will easily be able to identify these lightstick umbrellas. These umbrellas have a luminous shaft – right from the handle to the canopy and give radiant light which not only looks amazing but can be very helpful if it rains at night. Each of these umbrellas is unique and cool in their own rights. You may opt for anyone which you find coolest or you think matches your personality best and you will eagerly be waiting for the rainy season to arrive so that you can flaunt your super cool umbrella.